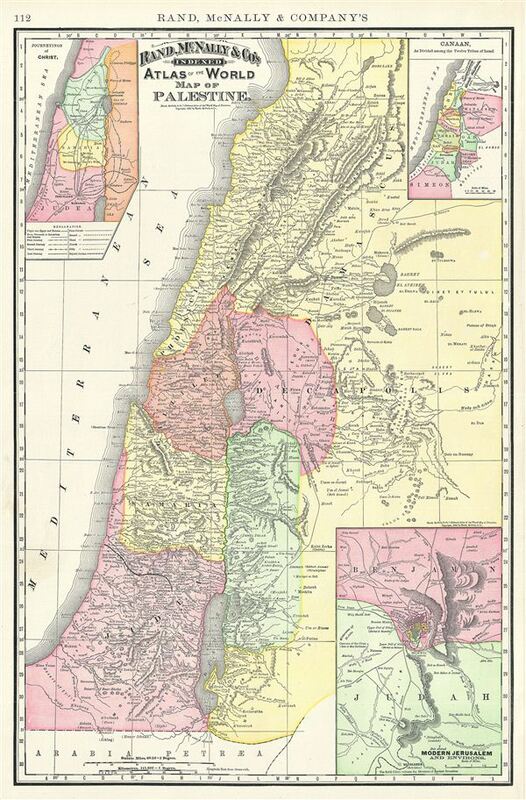 This is a beautiful example of Rand McNally and Company's 1892 map of Israel, Palestine, or the Holy Land. The map includes the modern day nations of Israel, Palestine and Lebanon with parts of adjacent Syria and Jordan. Both ancient and contemporary place names as well as the locations of Biblical events and ruined cities are noted. An inset in the upper right quadrant covers Canaan, the region as it existed in Biblical times with divisions for each of the Twelve Tribes of Israel. Another inset in the upper left quadrant details the Journeying of Christ and marks the routes of eleven journeys. An inset map of modern Jerusalem appears in the lower right quadrant with all principal buildings identified. Color coded according to regions and territories, the map notes several towns, cities, rivers and various other topographical details with relief shown by hachure. This map was issued as plate no. 112 in the 1895 issue of Rand McNally and Company's Indexed Atlas of the World - possibly the finest atlas Rand McNally ever issued. Rumsey 3565.030 (1897 edition). Philip (atlases) 1026 (1898 edition).